November 06, 2018 at 11:07 pm. West Virginia, possessors of the No. 7 ranking in the latest College Football Playoff rankings and one of the nation’s best quarterbacks leading one of the land’s most potent offenses, has its chances and its fate for a Big 12 title and even a spot in the playoffs in its own hands. Win out and win the league and a spot in the final four. 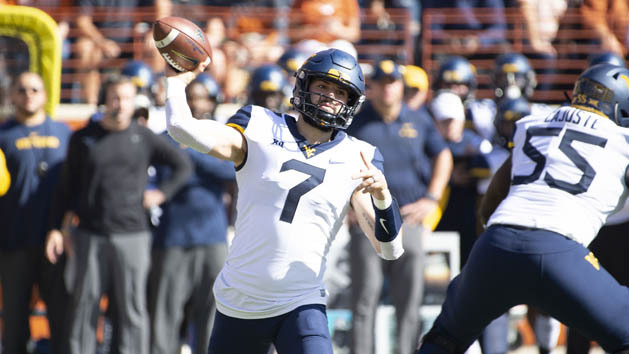 While the concept sounds easy, the road is full of steep obstacles, beginning with Saturday afternoon’s dustup in Morgantown against wounded but dangerous TCU at Milan Puskar Stadium. West Virginia coach Dana Holgorsen refuses to look past this week’s challenge against the Horned Frogs. “We don’t talk about playoff stuff,” Holgorsen said. “I don’t know if you’re referring to the CFP stuff, which we pay no attention to, or the Big 12 Championship, which that’s our goal. You can say that’s a lofty goal if you want to, but that’s everybody’s goal in the Big 12 is to play in that game, so that’s what we’re striving for. The Horned Frogs have struggled to force turnovers this year but produced three against the suddenly hapless Wildcats, marking the first time it’s been on the winning side of the turnover equation since its season opener over Southern. Despite the number of injuries to their defensive backs, the Horned Frogs still have the Big 12’s top-ranked pass defense, allowing 190.7 yards per game. West Virginia has the second-most explosive pass offense in the conference behind quarterback and Heisman hopeful Will Grier. For a team that used to winning but went the entire month of October without a victory, last Saturday’s result may mark a turnaround to the season. TCU needs to win two of its final three games to earn a bowl spot, but the road dustup versus West Virginia may be too tough of a hill to climb. It’s more realistic that the Horned Frogs can win at Baylor and then at home against Oklahoma State. Prior to 2012, the only previous game between TCU and West Virginia was a 31-14 Mountaineers’ win in the 1984 Bluebonnet Bowl in the Astrodome in Houston. The home team has won the last three games.